Moisture barrier bags, also known as foil bags, metallized bags and sometimes Mylar bags (from Dupont), provide moisture, corrosion and shielding protection for sensitive components. They are an effective packaging solutions to protect against corrosive damage caused by humidity, moisture, oxygen, salt spray, aromas, grease and other airborne contaminants. These bags are heat sealable and suitable for vacuum packaging. Most contain Polyester (PET) for puncture resistance. The metallic layers provide shielding from Electrostatic Discharge (ESD). 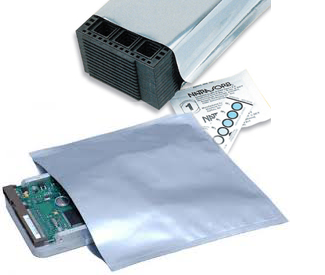 Barrier bags are mainly used to package ESD sensitive devices before they get placed on a circuit board.